You may have noticed that Hamilton typically named a lot of it's watch models with men's names. this wasn't always the case though. Originally the models were named for their general shapes... Cushion, Barrel, etc. After a couple of years new models were introduced with the names of swanky resorts from the era... Meadowbrook, Pinehurst, Piping Rock, etc. The first models to be named after people where the "Explorer Series" launched in 1932. The world was smaller at the start of the last century and much of it was yet to be explored. This series of watches were named after celebrated explorers from recent memory. 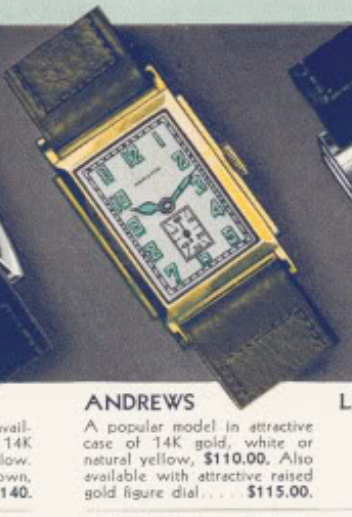 One of the watches from 1932 was the Andrews. It was produced through 1934. The Andrews came in a 14K solid yellow or white gold case with either a luminous dial or a raised gold figure dial. Eventually Hamilton referred to the latter styled dial as an "applied gold numeral (or marker)" dial but at this point in time it was "raised". The model is named after Roy Chapman Andrews who was a well known explorer from the 1920's. 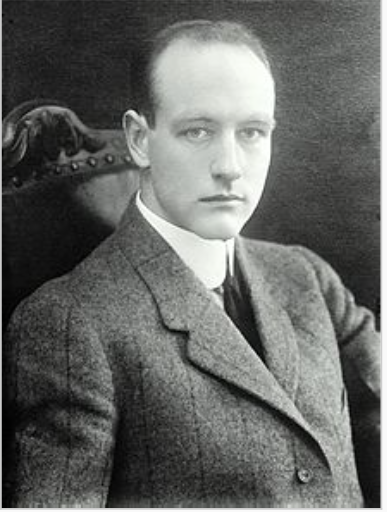 He's thought to have been the inspiration behind the Indiana Jones character from the movies. 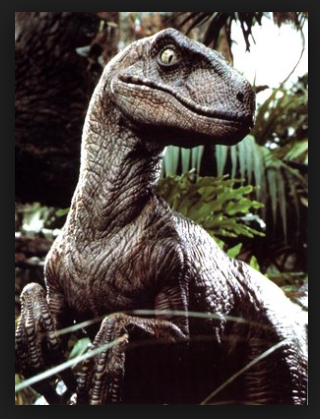 Among Andrews's accomplishments are the discovery of several well known dinosaurs, including the Velociraptor made famous in the Jurassic Park movies. Another interesting bit of trivia about the Explorer series is it uses an uncommon movement from the time called the 401. The 401 grade is a 19 jewel 12/0 sized movement that is based on an Illinois movement being made at the same time. Hamilton acquired Illinois Watch Company in the late 1920's and the 401 was one of the ways the acquisition was integrated into Hamilton's lineup. I recently had an opportunity to work on an Andrews thanks to a generous and daring friend. I've never worked on a 401 before and I was a bit hesitant because if anything went wrong I would not have any spare parts to make it right. But, in the spirit of the great explorers we decided to "go for it". It arrived in nice shape - a little dirty but ticking, which is always a good sign. This is an engraved dial and if need be it could be refinished to look like new. I'll give it a gentle cleaning and see if I can brighten it up a bit. One of the daunting aspects of this movement is the train bridge... check it out - five arbors have to be aligned at the same time in order to seat the bridge. This is the sort of set up where I cross my fingers when I take it apart. The 401 is a 12/0 sized movement and that's the same "size" as a 770 from 30 years later. Yet the 401 is obviously much bigger... what gives? Well the size is defined by the width of the main plate and not the overall size. So the 401 and 770 are the same width but that's were the similarities end. Without the dial in the way the dial-side of the main plate is somewhat familiar but unlike any other Hamilton movements before or since. With the setting wheel, minute wheel, hour wheel and cannon pinion out of the way, the front is largely stripped of parts. Turning my attention to the backside of the movement, the first thing to do is to make sure the mainspring has been let down so there's no stored energy inside. The empty screw holes on the sides are for case screws - in case the movement was installed in a three-piece case - which it is not in this situation. The first thing I took off was the balance assembly as it seems rather exposed in the corner of the movement. It's best to protect it from accidental harm. Then the barrel bridge is removed to expose the mainspring barrel. Now the train bridge can be lifted off. Now you can see how the power from the mainspring is passed through to the pallet fork. The second hand is driven by a special pinion and isn't integral to the gear train (the watch would run without it if needed). I also noticed one of the pallet fork bridge screws is missing. Hopefully I'll have a similar screw to use as a replacement. I don't have a replacement mainspring for a 401 so I just cleaned and reinstalled the existing one. It wasn't set too bad so it should be okay. All the parts are cleaned and dried. Time to go into the breach and see if I can reassemble it. Check out the second hand pinion... not much to it really. The first thing to go back in are the wheels. I'll put the pallet fork in after the train bridge is set - that way it won't interfere with the wheels' movement. Well, I'd like to say that was hard but it just dropped in place right from the start... that never happens but it did today. A quick touch to the center wheel makes all five arbors spin effortlessly. Now I'll put the pallet fork back in, along with a replacement for the missing screw. From there it's just a matter of putting the mainspring barrel back in, giving the watch a few winds and setting the balance back in place. The watch is now ticking away. A trip to the timer reveals an odd "hunting" pattern. It reminds me of a lawn mower engine that is cycling fast and slow, fast and slow. I'm not sure what is causing it but the first thing I'll do it pass it through my demagnetizer. Well, a few passes through the demagnetizer and a couple of attempts at cleaning the hairspring seem to have leveled it out a bit put it's still not perfect. Sometimes you need to know when to call it a day though. Every time I take it apart is an opportunity to foul it up. A man's got to know his limitations. The reassembled movement goes back into it's case and in my light tent the watch dial looks a little more splotchy than it appears in regular light to the naked eye. It's actually a pretty sharp looking watch. Great job! You make it seem easy but I’m sure it’s not. I am fortunate enough to have an Andrew in yellow gold. It appears to have been restored as some point or was very well maintained. It runs a bit fast though, about 3-4 min/day. I also have a Piping Rock in yellow gold. It keep excellent time! Unfortunately, the crown pinion gear must be stripped. It just barely catches to wind and set. I believe it has the 979 or 979-F movement. Would you be able to repair it?